Not long ago, I promise readers that I am going to have another giveaway on this blog. 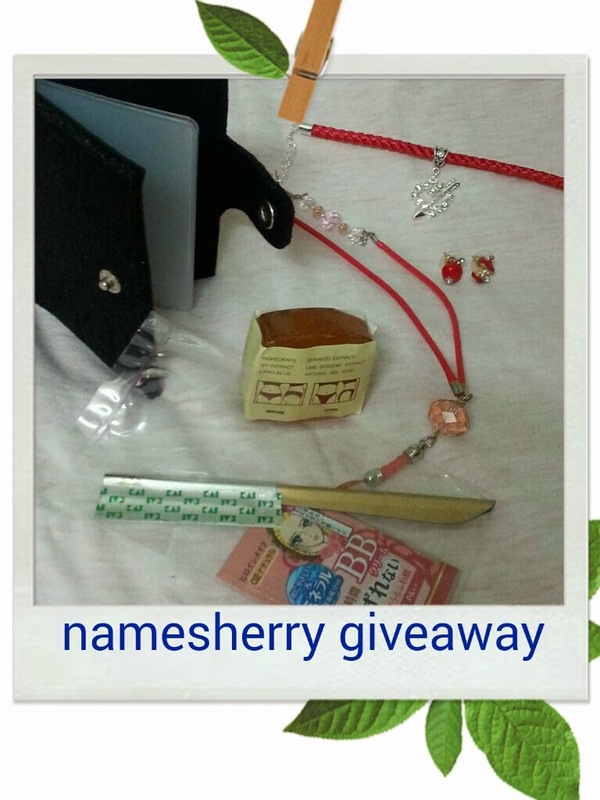 So here it is, the namesherry giveaway. Let's take a look what the prize awaits for ONE lucky winner. You can view picture detail check on instagram sherrygo. How to take part this giveaway? FIRST FIVE PARTICIPANTS GETS 50 POINTS. Put giveaway picture to side bar gets. 10 points. Giveaway ends on 16 March 2014, Sunday midnight Malaysia time. Winner will be select using random.org. The more points you gained, the better chance for your winning. Now my blog having 222 GFC followers. wow...so many gifts for 1 winner. @mNhL, yupe all for one winner. oh okay i got it sherry..can i know how many participants have take in this giveaway? for sure i must work hard on twitter after this if it already exceed 5 participants..
good luck, later free I check your post. 50 points for over 500 GFC followers on your blog. thanks sherry..how can i gain points from twitter? got it! so now total points are 130 points! @Kamariah Zulkafali, your blog with GFC points 30, not the pageviews that count yeah. you gained 10 points for blog post, 20 points for tweeting twice. total earn 60 points. @Mastura Aziz, you gained 10 points for blog post, 70 points for GFC at your blog. total 80 points. Readers : 7 so far.. I forgot to add the extra points for Kamariah and Mastura for being 2nd and 3rd to post the giveaway. you gained 50 points each. Amirah with total 140 points for tweet today. @Mea Away, with 20 points for side bar and blog post, 50 points for being 3rd to join. Total 70 points as not yet follow me on twitter. After you follow on twitter please comment then only your tweeted count. i've already followed u and tweet. thanks Mea Away, now you gained 80 points now. hai sherry, every day..only one tweeted bout your giveaway will be count? @Amirah, each day tweet will be 10 points each day. remember to tweet with this blog link and tag me in twitter. @Amirah, received your tweet 10point today total now 150 points. good luck, keep tweet everyday to earn 10 point each day. @Amirah, yes if you GFC has increase. Do let me know. thanks for tweet, another 10 points total now 160. @Amirah, tweet for today 170 points now. now your total points 180. I am the 4th? Or what? Hihi..
@Nurhazimah Hanan - 10 points blog post, side bar 10 points, 50 points you no.5, 10 points for tweet. total 80 points. @Amirah 190 points, received the tweet for today. I,m so sorry.The tweet link I gived just now was wrong because I did'nt tweet with my blog post.This is the real tweet. @Nurhazimah Hanan, this tweet link does not count because you need tweet my blog post link, not your blog post link. @Amirah 200 points for tweet today. @Syuhada Salleh, you gained 280 for GFC followers, 10 points for posting giveaway on blog. Total 290 points. @Amirah with 210 points today for tweet.